What is a photographer's dream? Mine is to photograph the unseen, the never thought of, the moment that everyone looks at it and has individual thoughts / desires. I found one moment like this, for a photographer, in Gettysburg PA. I was in Gettysburg for a work assignment - to be trained as a Lead Auditor for nuclear suppliers. Gettysburg is very historic, and touristy. One can take a photo of your holiday at Gettysburg, and see a similar photo in someone else's collection (to some extent). However, I came across something I believe only a photographer would wake up and smell the coffee or roses for. That would be the Actual equipment and process used to create photos during the Civil War period. There is a lot to take in when walking around Gettysburg. There are several Arsenal stores to purchase reproduction guns, canteens, and the like. There are a lot of places to eat, souvenir stores, book stores, and craft stores. There are even plenty of photography studios for a town this size. Tourism is what drives this town. However this one small shop, competing against every other shop in town for business, was quite unique in my opinion. Gibson's Photographic Studio specializes in taking photos with vintage equipment and process. From the camera, to the cloths, and completing it with glass plate photograph with all the chemical processing that would be found during the Civil War. This next photo I had taken at Gibson's. 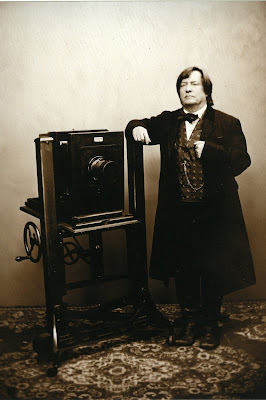 I was able to observe and photograph for myself, the best I could, the process of wet plate photography. The inside of the studio is pretty cool. Photographs all over the place and people I have not seen before, to people I recognize from television and movies. The studio itself contains the darkroom, and is softly lit and balanced with cloth filters coming across a skylight. So, I am all dressed up as you see in the photo of me (couple photos above), ready for my turn to stand still for a while. The photographer needs to evenly coat the glass plate with some collodion solution. Nasty stuff to some extent, when handled incorrectly. After the plate is tilted to move the solution to all the edges, the excess is drained back into the container, and any buildup on the edge that will not drain off is wiped off. The glass plate is then moved to the dark room, or dark tent, placed in container, and a silver nitrate solution is poured over the glass plate. This begins the the binding process of iodide and bromide, making a silver halide coating on the glass that will be light sensitive. (As soon as the solution was poured, I believe Rob closed the curtain to complete the preparation. After whatever time, the glass plate was loaded into the camera, in the dark. The victim, me, stands posed while the camera is focused, remains posed during the binding process, remains posed while the camera is loaded, and remains posed while the photographer removed the cap from the lens by hand, and counts off for approximately 15 seconds. Now you tell me, who has the the more difficult job? Now, I many not have all these steps correct. So do not go out and try this then point you fingers at me. I am not a darkroom guy. This is why we have professional photographers, that know what they are doing. So with that disclaimer lets continue. The glass plate was taken out and placed into a container with the developer. I could see the glass plate turn into a negative. The glass plate was taken out, and continued to change . . .
At the right time, the glass plate was placed in another liquid bath which it turned from a negative to a positive. Then I believe this is the fixing agent bath that washes off any of the unexposed silver-halide. A final water rinse, dry, a quick varnish, and you have a photographic plate to make prints from, as the print at the top of this blog entry. This last photo is my glass plate framed. My digital photo of the glass plate does not do it justice. It is really nice looking in the frame. If you have payed attention, you may have noticed the image on the glass plate is backwards from the one photograph above. It is suppose to be. When you take photos from this plate, the image is flipped to what the camera was looking at. If you are ever in Gettysburg, please have a photo taken by Rob Gibson. If you want a glass plate photo, take a drive to Gettysburg to have a photo taken by Rob Gibson. Get the hint? Rob's wife Dee is a great host. As soon as Rob found out I liked photography, he said I should dress as a photographer and stand near the camera for a photo. He was right. Dee pulled the clothes off the rack, and away we went. You can choose from any combination of characters that were present during the Civil War. 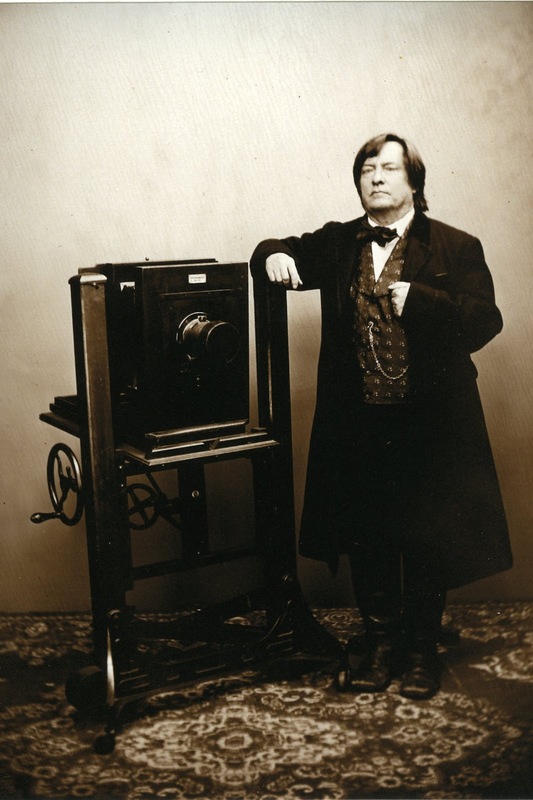 For more information, or to go and have a wet plate photo done . . . Cool. It was a very nice experience. They made it fun. I am using the photo taken of me on the back of my business card. Everyone loves it. I do want to make a trip back one of these days. Classic Rock - This is the band . . .